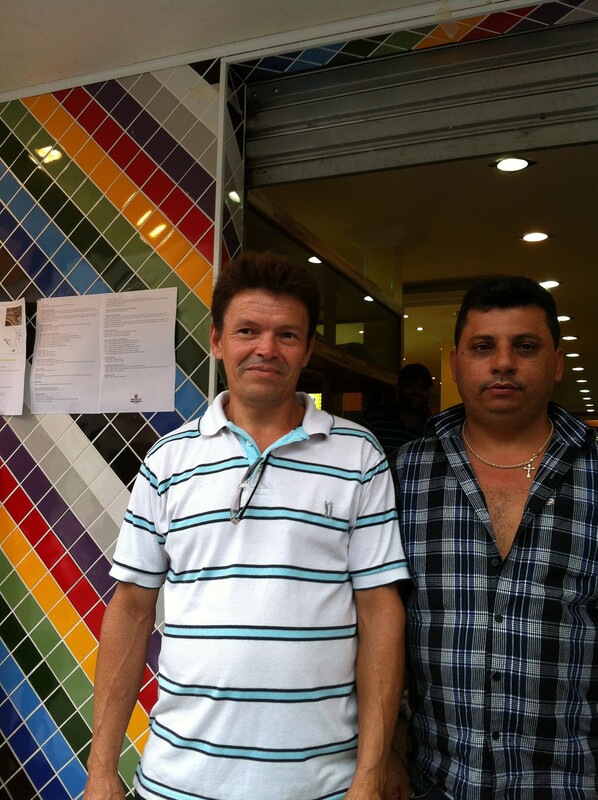 Pedreiro Ataide with market owner in front of the store. Trust and reputation is everything for a local builder. 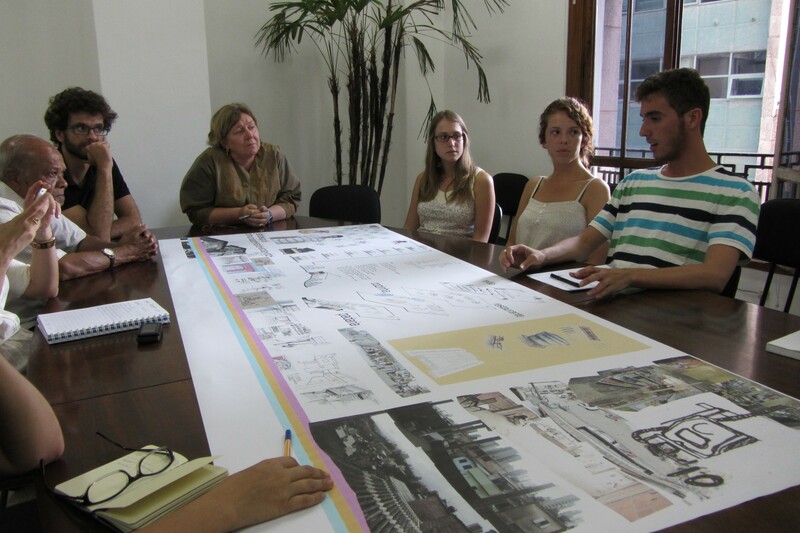 Students show their study to Elisabete França, director of the Secretariat de Habitaçao in Sao Paulo. Left Bhau Korde and Fernando Botton. Being in touch with social reality is extremely substantial, in that it develops an understanding of a culture – of ways of doing, building, exchanging and also relating to the people themselves as well as to the urban space as a whole. Besides, it generates the practice of collective values, which collaborates to create collective life and social organization. Thinking it through this way, a socially relevant project can be a way of constructing this relationship and this proximity with this social reality, and starting to signify a way and a means to get to an end. That is: the community, mainly the pedreiros, and architecture students can work together to develop a collaborative achievement, in which the students learn with the local methods of construction, the culture of living and the way of relating in that context while the pedreiro can also get the technical and scientific support he wants. What can be constructed through this is another way of thinking of the irregular settlements such as the favelas: learning what is done in this place, and developing a project that proposes new ways of dealing with this space’s problems and expanding the potential of what works. Emanating from the pedreiro’s project, the student can give consultancy to the pedreiro, contribute to the project with ideas for an easier way to make the built form, share details of design, exchange ideas of transforming what was meant to be done, harmonize cost and quality, suggest better distribution of rooms, and many other things (but always by remembering that we must not change everything, and strive to keep the language and the essence of what was first provided). Moreover, this idea of collaboration must involve not only the pedreiro and the student, but also the owner/contractor, the community and, ideally even the authorities. If the project is lead by the pedreiro, who gets the ‘consultancy’ of the student, it can also be constructed by the local labour? This way it would contribute to the local economy and would engage the community, create a sense of belonging necessary to generate the idea of value and also enhance the maintenance of what’s being built. Furthermore, if the city hall, instead of investing in buildings ‘planted’ in the middle of the favela’s space and contracting a company to construct it, could finance the pedreiros (providing capital for the construction) and this would generate jobs in the community and provide tools for their own development. Of course, this whole idea of involving the neighborhood, the pedreiros and the students is extremely new in all aspects (and also an innovation in academic environment as well as in the social one). How does one introduce a new way of doing and building in an already established culture? How do we set up the participation of the architect in this already established relation chain? These are questions we will be able to answer only when we start working. Sometimes the process unfolds when the practice starts. However, what we certainly know is that if there is one particular ingredient in place then the process will be smooth. That ingredient is trust. The collaboration between the architecture student and the pedreiro (as a delegate of the community) is only possible by launching a relationship between both: a social contact, a familiarity, basically by instituting trust.